Hope and energy. I don’t know why I start by writing “Hope and energy”. Instead some part of me writes “Hope and energy”. Why? I don’t know. 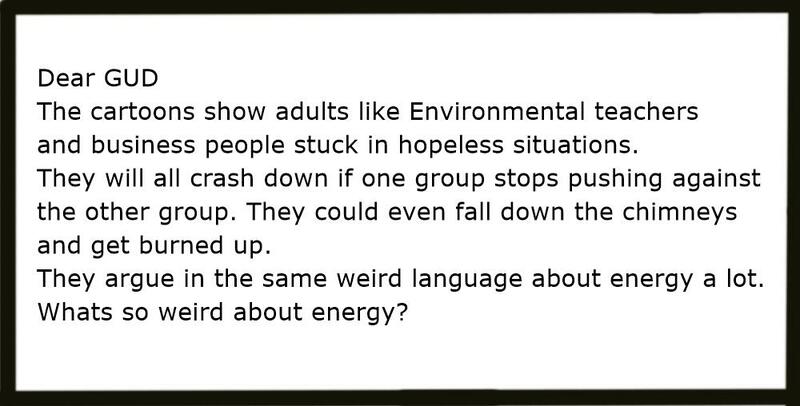 Is some part of me suggesting it could be a heap of fun to explore the relationship between hope and energy? What if, for instance, hope and energy cannot exist without each other? Hey, check out this video I just spotted. Mathematics and the universe would have been so much more exciting for me if it had been around when I was a 12 year old like you, Hang in – it gets more and more fascinating. The Mandelbrot Set – The only video you need to see! Remember we chatted about a human being consists of myriad elements – you know – billions of microbes, nerve systems, brain patterns etc – and each of our elements interacts with everything else in its own unique way. We discussed two of our elements in particular – the ego (bossy, stroppy and divisive) and compassionate (kind, inquiring and connecting). You’ll pick their voices in the above cartoon. 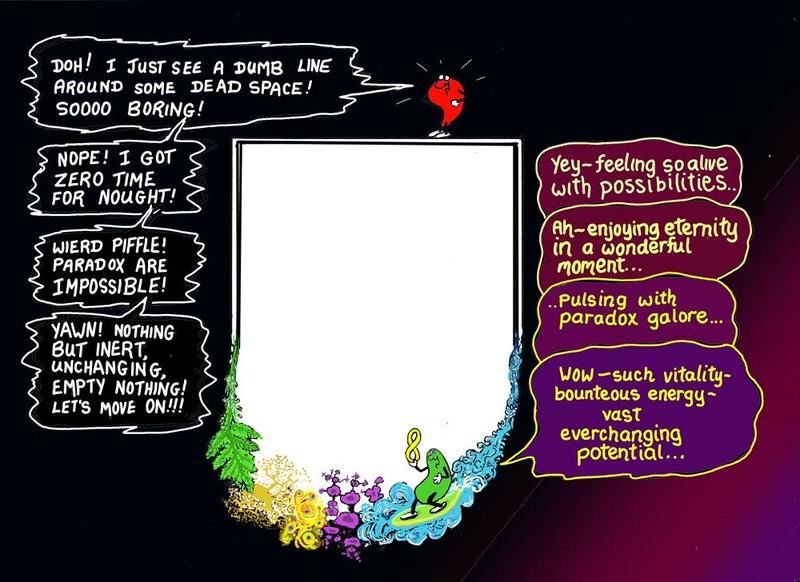 Lets imagine the “white space” is a universe. 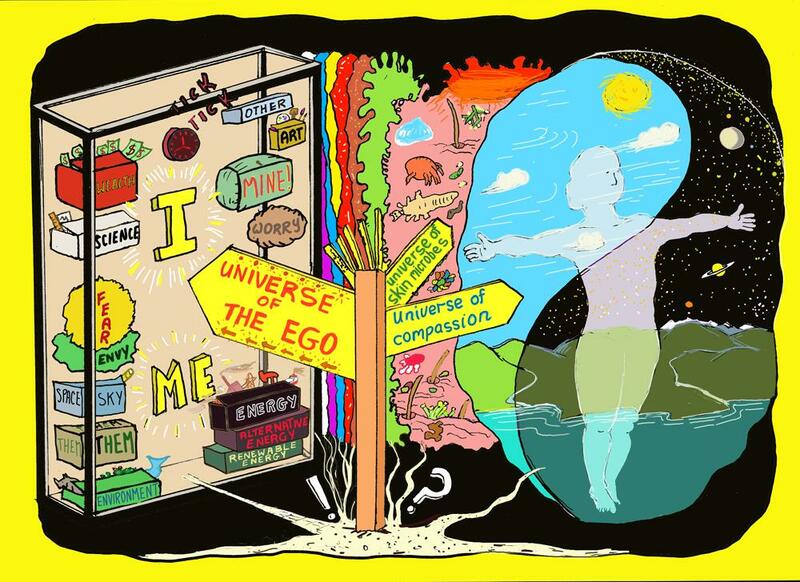 The ego and the compassionate elements seem to be seeing two entirely different realities. The ego experiences a barren, colourless universe, a sort of rigid, limited, box-like universe that exists somewhere “out there”. The compassionate element experiences a more vibrant, colourful universe, an ever-changing place filled and flowing with forms and paradox. We seem stuck in a conundrum. Which universe is for real? 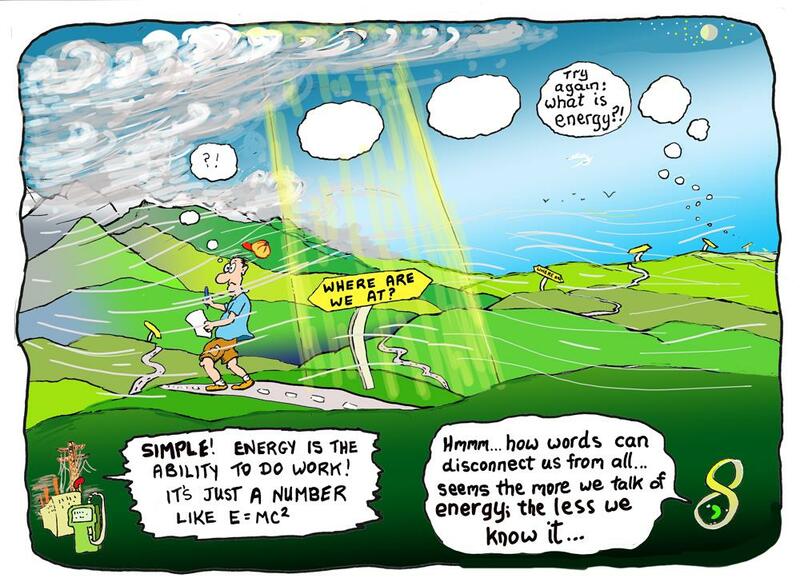 Which is the universe of true energy? Crazy? Impossible? How in the heavens can we survive if every possible part of us experiences a different universe like that and every human being experiences a different universe and all these trillions of different possible universes have different energy. I find it mind-boggling to try and imagine of any number of universes at once. It just makes nonsense. At the same time they say we sense “sensations” such as emotions. For instance, we may see (sense) a snake or a tiger, become filled with a sense of fear, and experience a sense of pain if it bites us. We may become just as fearful if we imagine we see a tiger or if a stick pricks us in the foot just like a snake might. It can be so difficult to enjoy a true sense of reality when our perceptions, responses and emotions are so mixed up with each other. Words often seem to fail us yet somehow most of us make enough sense out of nonsense that we survive. 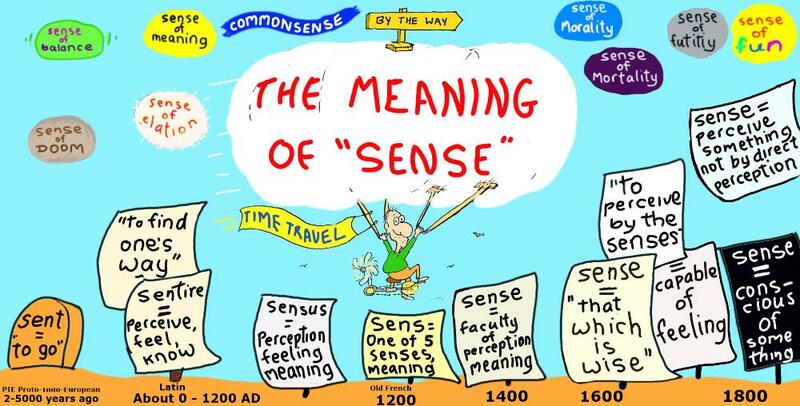 We somehow “make sense” of things, use energy wisely and “find our way”. “Where are we at?” The wind roaring off the mountains only answers by tugging at my clothes and buffeting my body. “Where are we at?” The clouds race overhead in silence, blotting the warmth and colours of the sun into chilling waves of grey. “Where are we at?” The stream just responds with a chuckle as its waters dance around the boulders and disappear in the deep mystery of the pools. I walk the rural roads listening for a reply from the universe and only hear the rhythmic pat-pat of my shoes on the ground. It seems I can walk forever asking what energy is and never know it. 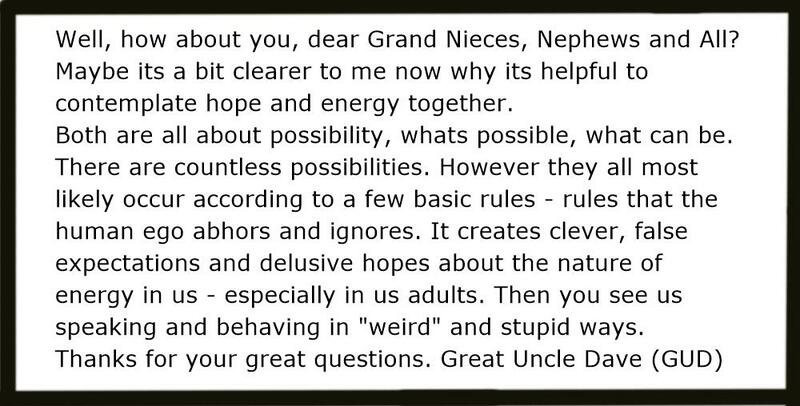 How can I discuss the unknowable with my Great Nephews, Nieces and All? The sun sets, my world goes dark and the wind now feels mean and chilling. My thoughts soon become filled with alarm signals and symbols of comfort. 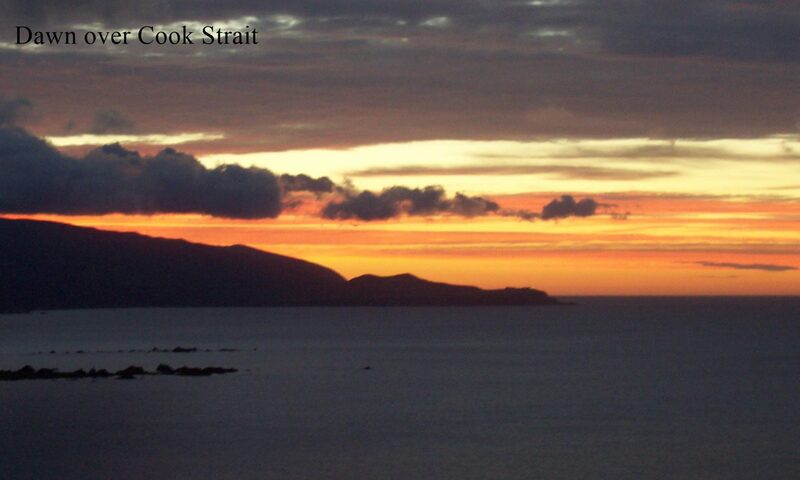 The wind gusts and flitting clouds had reminded me in continuous, bounteous change before the sun set. Now they remind me of my mortality – I could die if I am not careful. A sustaining balance has gone. I see the shocked faces of the people who discover my cold remains huddled under a roadside bush. 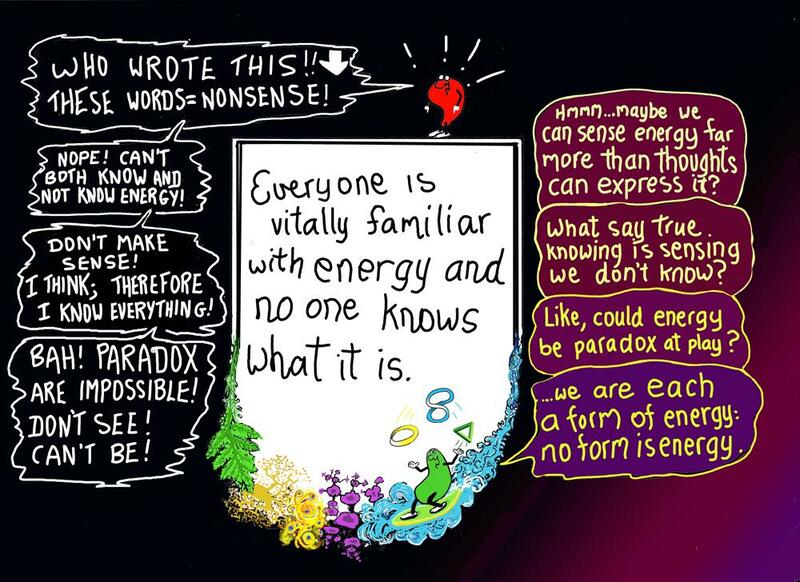 What if human beings can never “know” what energy is? How on Earth then do we survive and have fun without starving or freezing or burning or drowning or poisoning and destroying ourselves in any of the myriad other ways possible? We discussed how everything is paradox. So words cannot really describe what energy is. 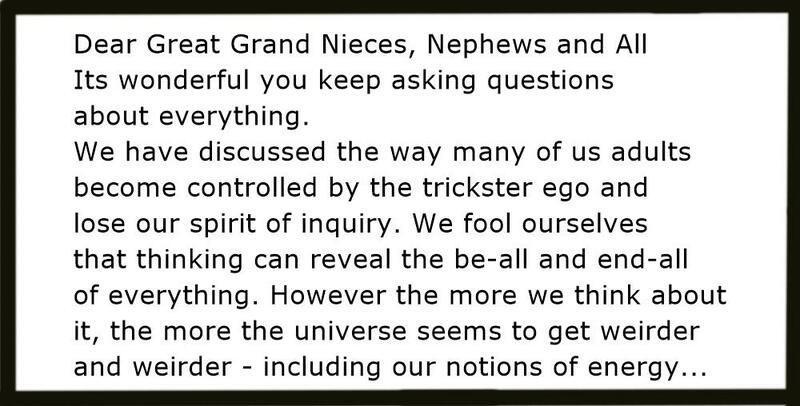 We discussed the trickster ego in us and how it alters all our perceptions in arrogant greedy ways. Energy. Hope. Universe. Paradox. You. Me. The ego. Everything. What’s the connection, if any? Maybe the ego can make it impossible for us to experience any universal connection. It can certainly make it difficult, as can be seen in the above drawing. It pictures you and me developing false hopes and dreams as soon as we enter into self-consciousness. 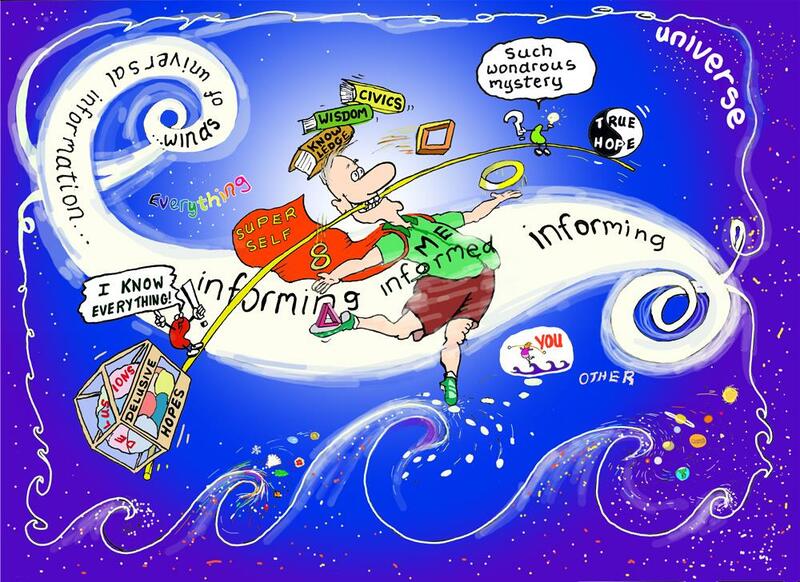 You probably agree: many of these delusions are foolish, if not plain dangerous. The delusive hopes of our childhood seem relatively harmless even though they can cause us to fall out of the tree and crash on the ground, to be mauled and eaten, to drown, you name it. In general, we just maim or kill ourselves. 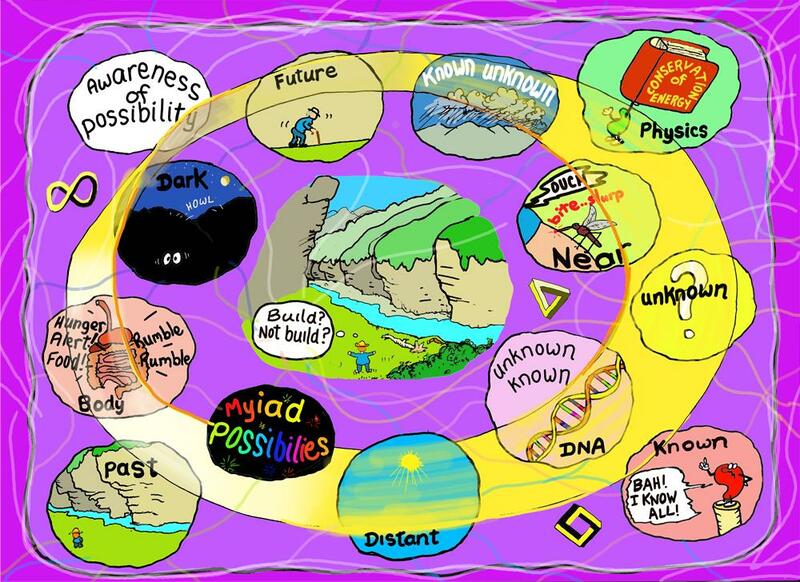 Did you notice a couple of things in my picture of the nature of hope and energy. Well, for a start, there is me. Remove me and it becomes an entirely different picture. And there is me performing a balance between my delusive hopes and my true hopes, whatever they are. To use an old saying, I am surviving by the skin of my teeth. What happens in an instant if I focus too much on one end of the balancing stick of hope? Oh, and maybe you are asking, “Hey, why is there no mention of energy?” Well, its very true my drawing skills are feeble compared to those of Leonardo Di Vinci, Vincent Van Gogh, Gu Kaizhi and other great masters of portraying life and movement. 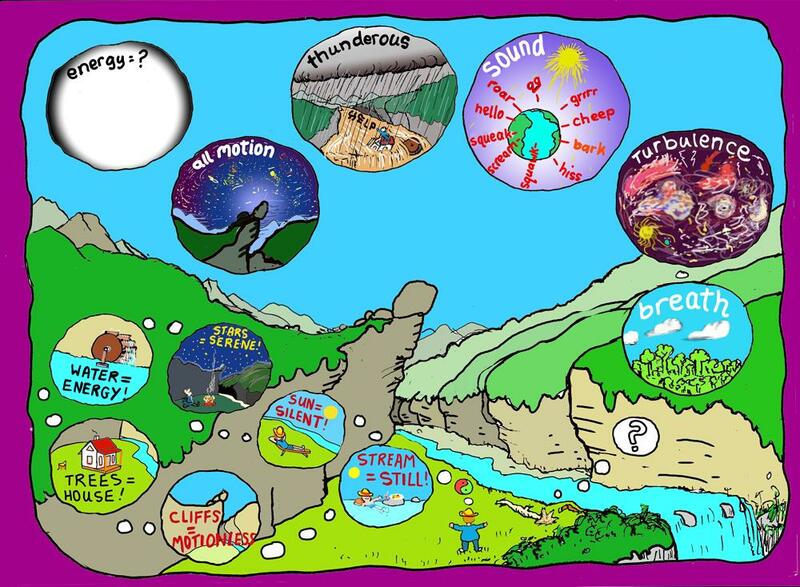 However maybe, just maybe you catch a glimmer, a sense, a spirit of flow, movement, change and stillness in the cartoon? This is energy. What happens next when the wave passes? What happens to me? What do I do? The possibilities are enormous. This vast potential is also energy. Considerations: We are the breath of the trees. In the silence of the sun is all the sounds of life on Earth. In serenity is turbulence. In stillness is thunderous clamour. All is movement. Energy is all potential. ???? Would you build your home in the river bed? How many possibilities can you imagine? A few? A myriad? The universe seems full of possibilities. Do you feel it is a hopeful or hopeless place to build your home? How do we make a wise decision? Hope is a funny, old thing – in fact it is old as the first human being. Its funny because forms of hope can change faster than clouds in the sky. And hope is a thing because it’s a force like everything else in the universe. I just checked our dictionaries. They define hope as a feeling of optimism; as a feeling of trust a person has that a decision or situation or belief will somehow play out OK for them. However, did you notice this definition of hope doesn’t mention there are many types of hope – wise hopes, foolish hopes, dangerous hopes, etc. What is super OK for me may well be very terrible for you. And our hopes somehow inform every action we make. 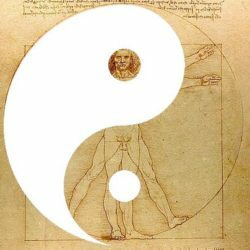 A paradox of the universal potential: every possibility is unique; all are the same. So, again, where are we at? I’m not sure. Perhaps you can see our way more clearly? What do we know? Maybe we agree that every human senses both hope and energy with every element of their being and yet no one truly knows what hope or energy is? Both seem to be great mysteries and paradoxes, which is why words fail to describe them. 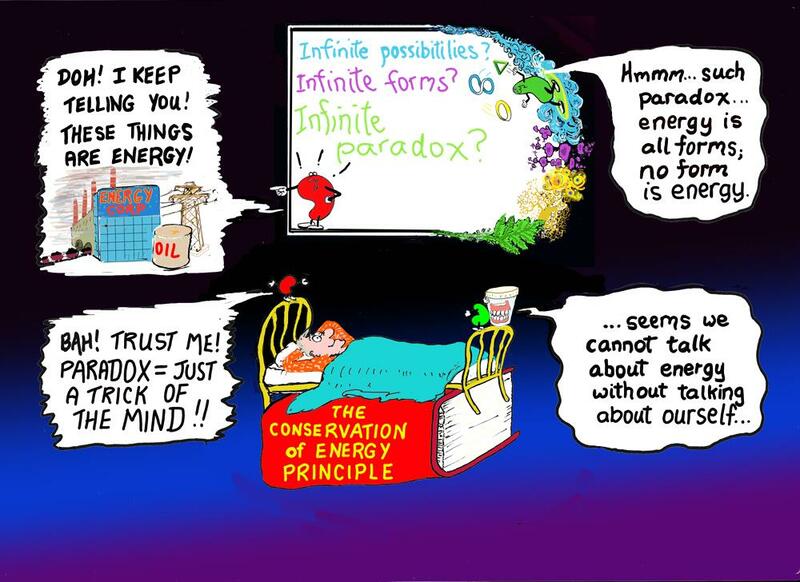 According to the Conservation of Energy Principle, energy comes in countless, ever-changing forms. This seems true of our feelings of hope too. 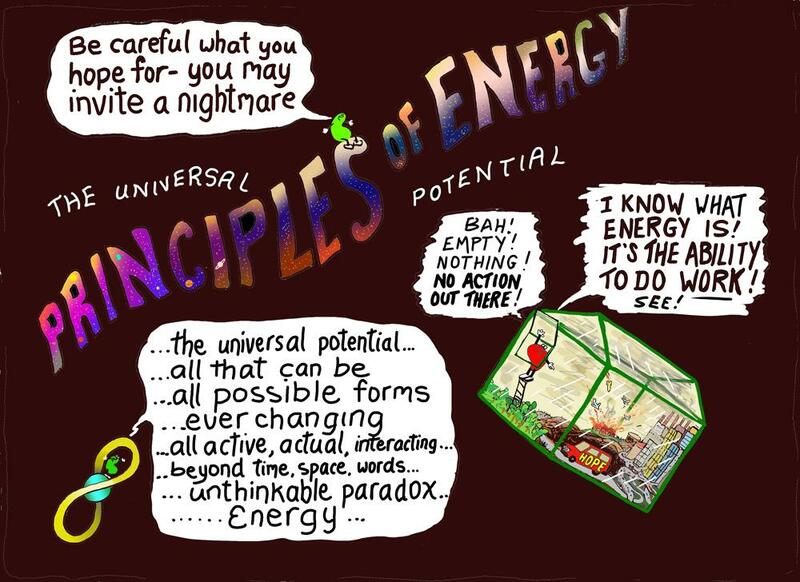 In other words, energy is the universal potential and that includes you and me with all our hopes and dreams and, of course, the human ego. Yes, remember we discussed the trickster ego with all its ingenious self-deceits and denial of the principles of energy. It shapes our hopes so we act in greedy, uncaring ways – especially us adults. 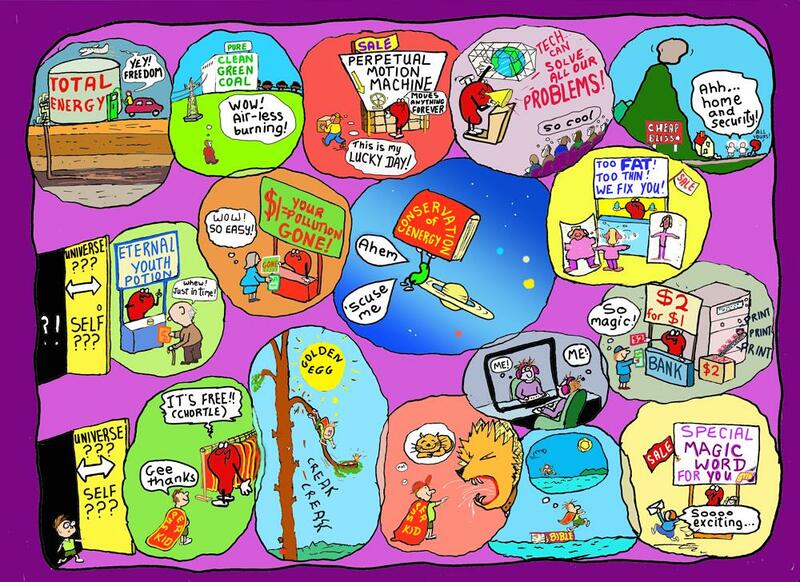 We first adopt “weird” notions of energy, then delusive hopes and then self-destructive behaviour. Thus we risk depriving ourselves and future generations of vast, wondrous possibilities that exist.